Spring is in the air! Even here where we had sooo many winter storms, it’s finally getting a wee bit warmer. Yeah! Yes, I made these flowers! 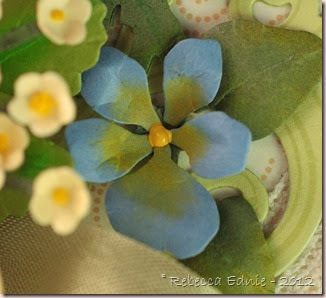 I used Susan’s Garden Sizzix dies to cut all the petals and painstakingly shaped and coloured each one as well as 13 leaves. I used Fancy Flourishes in the background as filler. 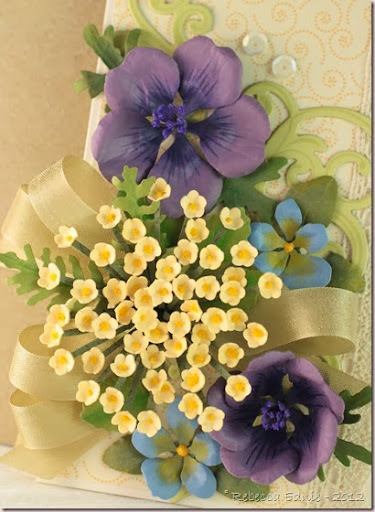 But I didn’t like how the card showed through the yarrow so I added more leaves and some ribbon poufs. It isn’t a full bow under there, just some loops which is why I call them poufs! Just some flower closeups. This one is an open hardy geranium. I used to grow these, they are so lovely! If you make these, add the pollen BEFORE rolling up the center. It’s so much harder later! 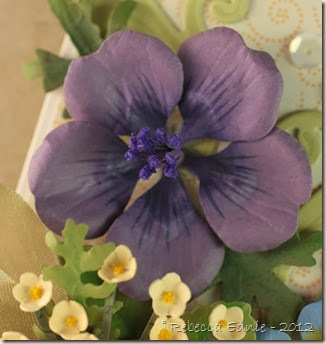 A semi-closed geranium. Made with the same petals, I just cupped it more in the center so the petals stood up. These flowers have airbrushed colour in the centers and lines drawn on with Copics. Susan recommends Pan Pastels for the centers and I can’t wait to get them but airbrushing looks just as good. It doesn’t work for adding lighter colours though so I use Pastel Pencils or my old SU! chalks for those. Yarrow. This one takes a while to make with all those tiny flowers. Each one has a center of pollen which I glue in with a Viva Paper Pen. I could use glue but since this has a very fine tip and is dimensional, it makes the centers look more realistic. You could use a dimensional glue but since most aren’t matte, it isn’t the best choice; if any shows through, it will look weird. I miss Matte Accents (sister to Glossy Accents) by Ranger. BRING IT BACK!! See the yellow in the center and on the leaves? Definitely won’t work with Copics. This one is the violet. 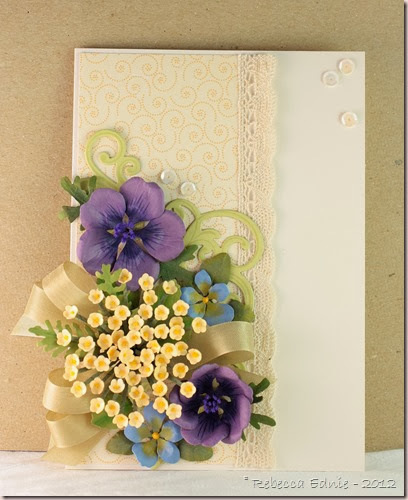 It comes in the same set as the Pansy and though I didn’t use it, I used some of the pansy leaves as filler. It’s the ruffled one in the top left corner. I hope you enjoy the hop! Like my card? Please leave a comment or sign up for email or RSS updates! They are on the sidebar. Paper: Spring moss, cream CS, DP-PTI, olive, artichoke, banana, brocade CS-SU! I agree that this needs to be framed -gorgeous! OMGoodness, what a lot of work but that bouquet is gorgeous! Thanks for sharing it. 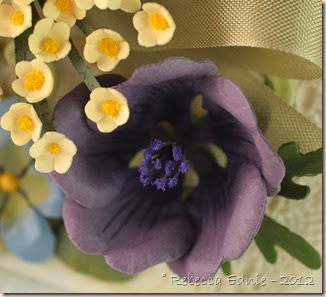 Wowza- what stunning handmade flowers! Such a beautiful labor of love! Wow… wow..I bet this one goes in a frame for everyone to see. 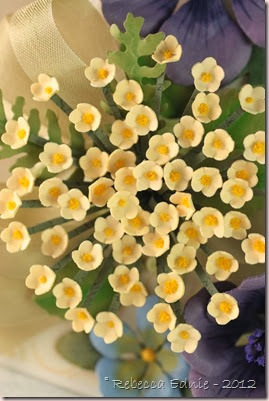 Your flowers are just stunning! I can see a lot of love and work went into this one. Wow–this is the most amazing card I've ever seen. Definitely stunning. I hope you have people in your life who appreciate all the work that you put into this. OHHH your card is STUNNING! I LOVE your flowers!! !Happy Hopping! Have a GREAT day! A-M-A-Z-I-N-G!!!! So much work and efoort but it shows off. Gorgeous!